Do you love French cuisine, but find yourself too busy to make it at home? 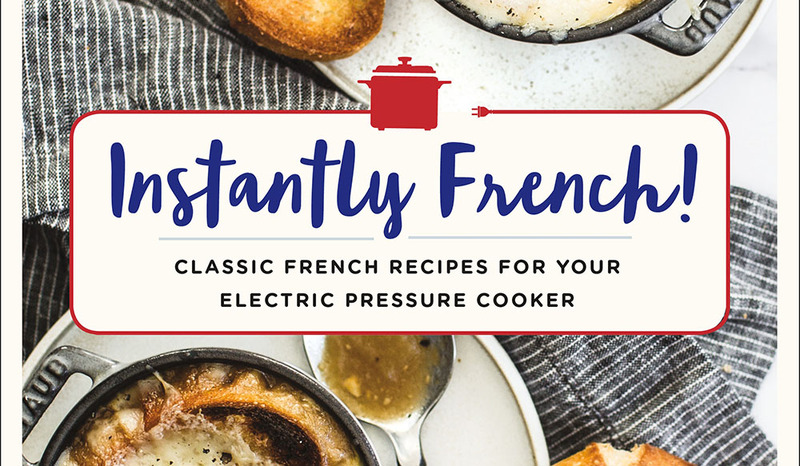 Well, if you have a pressure cooker, you should pick up Instantly French! by Ann Mah. Inspired by French cuisine, this cookbook is like a collaboration between a pressure cooker guide and a French chef. The pages of Instantly French! are filled with simple, easy-to-follow recipes complemented by rustic-styled photography. The photos really drive home the idea that this is French cuisine we’re making, even if we’re doing so with a pressure cooker. It seems a bit like cheating, but there it is. There are seven sections, after the introduction: First Courses; Soups; Chicken; Fish and Shellfish; Pork, Veal, Lamb and Beef; Vegetables; and Desserts. Yes, desserts. Apparently you can make sweet delicacies like “Foolproof” chocolate cake in a pressure cooker! Each recipe has the serving portion, an introduction talking about the dish itself, a clear ingredient list and easy-to-read directions. She uses steps instead of paragraph/narrative structure for the directions. Mah’s writing flows very well – it’s easy to read through the pages without even realizing how engrossed you are. Her story about getting into using the pressure cooker is very (very) relatable. But that’s not the best part. She talks about using multifunction pressure cookers, and helps alleviate some of the worries that non-pressure-cooker-users may have (like, the modern units won’t explode); also details how to use the different functions. Only her writing is much more interesting than a user manual, so you actually read it. Peppered throughout Instantly French! are blue blocks of tips. These add that extra oomph to the book that adds value (What kind of cream? on page 13, for example, answered a few questions about the different types of cream used in cooking. Turns out, they’re not all interchangeable!) Also, anytime special equipment is needed, it’s highlighted very well so you’re not surprised when you get half way through the recipe. The downside is that there aren’t any clear dietary guidelines. Home cooks with special diets (vegan/vegetarian, gluten-free, diary-free, etc.) will need to read each recipe very carefully before proceeding. Other than that, Instantly French! is great for people with pressure cookers. If you don’t have one, maybe look into another French cuisine cookbook.